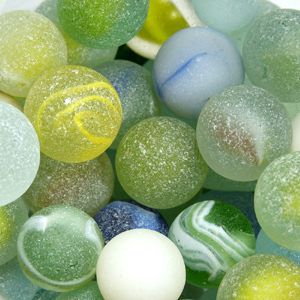 Sea Glass Marbles – How do they end up on the beach? How did they get there? What were they used for originally? Did you play with marbles as a child? I know I did. I’ve heard many theories about how marbles occasionally wash up on the strandline and had always believed it was from children playing on the beach, maybe using marbles as ammunition in a catapult, but here is another theory. Many years ago, ships were loaded with heavy items to provide ballast to provide stability and counteract the effects of weight above the water level, marbles provided this inexpensively and effectively (not as inexpensive as sand though which is used to make the glass). Sometimes the ballast would be disposed of to change the effect on the movement of the vessel and so the marbles were dumped into the sea, one day to return to the shore.